A cube is a set of Netrunner cards designed to be drafted. If you’re new to the concept, I’d highly recommend reading this excellent article by SneakySly: Cube 101. In brief, a cube is a set of cards that you put together and draft decks from, with the intention of playing these decks against other peoples’ cube-drafted decks. I’ve had a couple of requests to write an article about cube design. I love Netrunner and I love playing cube, so I’m more than happy to share my thoughts. Whether you want to design a cube yourself or whether you want to hear what goes into cube design, hopefully this will be an entertaining read. Ever since trying Netrunner cube and reading the aforementioned article, I’ve been enthralled. It’s incredibly fun, and it led to me building on the Stimhack cube and eventually forking the cube into my own. I’ve updated, changed, and fixed a lot of things over time and, in my opinion, the cube is better for it. I aim to cover and talk about my thoughts and experiences on cube design and how I’ve built up the cube over time, particularly in regards to advising and informing others on how they can do the same, or providing reasoning for the direction my cube has taken. I want to give a massive shout out and thanks to my friend and accomplished Netrunner player Alexander “VinegaryMink” White. He has proof-read and edited the article, and a lot of work goes into that sort of thing. Alex has also helped with cube design in the past, and was the one who got me interested in cube in the first place. This school of thought is largely adopted from Magic: The Gathering cube design, which has been matured and refined throughout the years. The idea is that a cube is improved when you have more singleton cards, even if one is ‘better’ (in terms of benefiting how fun the cube is) than the other. Why is this good? It comes down largely to decisions. Drafting is all about making decisions, and cards, however similar, can be subtly different. One might generally be better, but one of the most interesting and skill testing parts of drafting a cube is correctly identifying which of two very similar cards is a better pick. More singletons means more decisions. If your ‘pack’ of cards has five cards twice, you’ve got fewer decisions to make than you would if your ‘pack’ has ten single cards in it. This is one of the main driving forces for this school of thought, and enhances the things that people love cube drafting for. It also means more variation in games you play, which tends to make for more playability. I want to point out here that my cube is not a fully singleton cube. The philosophy from Magic doesn’t apply fully to Netrunner, due to the way cards are released and due to the relative maturities of both games. 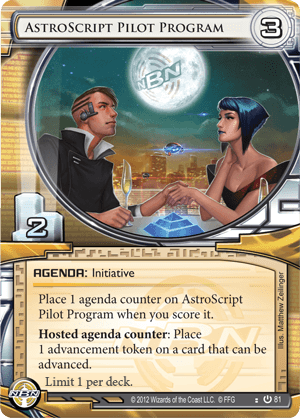 That being said, singletons are something I think Netrunner cubes should strive for; there are cases where it’s still best to double (or triple) up, but this is less of a hard and fast rule and more of something to bear in mind. You can’t really have the “Grail” suite of Galahad, Merlin and Lancelot as singletons, and frankly the card pool of Netrunner is in a spot where only so many cards of a certain ‘type’ exist. Going to singletons for all economy cards would likely be a disaster. Make sure to give an extra thought when adding more than one copy of a card into your cube. Is it worth it? What do you gain from multiple copies of a card? Is it worth what you lose? There are a few things to note here that I view as Good Decisions. The first decision I want to highlight is the breaker suite. All breakers are usable (and indeed I have gone 3-0 in drafts where I’ve used all three) but they are distinctly not an AI or multi-use breaker (such as Chameleon or Crypsis). I think it’s a good idea to give runners the option to fall back on a substandard set of breakers but I don’t think it’s a good idea to give them an AI (or AI equivalent) breaker. AI breakers are extremely powerful in cube, so giving AI means that players can draft economy and ignore much of the other card pool. Giving substandard breakers and the option to improve them is similar, in my mind, to the way players can click for a credit in Netrunner’s rules, but have the option to take better economy. I’ve made the decision to include five Priority Requisition. Though I feel very strongly that you should give your players enough agenda points to make a legal deck, Priority Requisition is a conscious choice I’ve made over, say, blank agendas. My cube supports a big ICE subtheme/archetype (Mutate and Oversight AI both being included), and Priority Requisition aids that archetype while acting as a relatively unexciting ‘filler’ agenda that other decks can play to make up points. I think you should be very conscious about what sort of agenda to include, but Priority Requisition supports an archetype that I want to support without needing to devote more cube slots to it. AI (or almost-AI like Chameleon) is something I’d advise against putting in your cube starter packs. Letting players be able to break every piece of ICE is great, but AI discourages drafting breakers a lot more than one might think. Why draft a full suite of breakers when you can draft economy and AI instead? 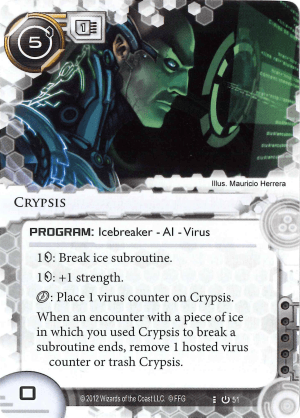 This is the very same reason that cards like Crypsis don’t show up in my cube. It regularly does not make for interesting draft decks, and that effect is bolstered greatly when players get it for free. One decision that I want to highlight is the decision to include economy cards for both sides. I think this is generally a good idea because it allows more slots in the cube dedicated to cards that aren’t economy. It’s possible to make a cube without any economy in a starting set but the cube itself would need more economy cards, which I feel is a shame. Some cubes use Launch Campaign over Private Contracts but I like the ‘mirrored’ nature of it versus Armitage Codebusting, and I like that it’s harder to trash. Reusable, limited, but very much substandard economy cards are the sort of cards that should be including in starter packs. Economy cards are an important part of cube design that I want to make a few bold statements about. Firstly, I abhor the inclusion of economy that is fully reusable and can sustain itself. What do I mean by this? I mean that if you draw this card, you’re almost actively discouraged from drawing more cards per turn to continue with your engine. The biggest culprit is Magnum Opus. It’s very often correct in cube decks with Magnum Opus in to install their breakers then click Opus every turn. This regularly invalidates most of the cards you drafted that aren’t breakers or Magnum Opus, and it feels oppressive to play against. This doesn’t mean reusable economy is bad. I think Professional Contacts is absolutely stellar design for cube. It encourages you to see more of your deck and actively rewards you for making good card choices throughout your draft. Professional Contacts is great and I feel like every cube would benefit from its inclusion. It’s an engine, sure, but it’s not self sustaining. It forces you to see more of your deck in a way that Magnum Opus can’t. What about cards like Kati Jones and Tri-Maf Contact? As well as both being first-pickable and incredibly strong draft cards (you should definitely be careful with including either due to their strength), including these cards is not necessarily bad cube design because they do two things important things: you can disrupt them AND they are designed such that they only ever take one click per turn. You cannot spend your turn on either card. Both are resources with big downsides if you trash them, and that is good when combined with the fact you have to do other things on your turn. 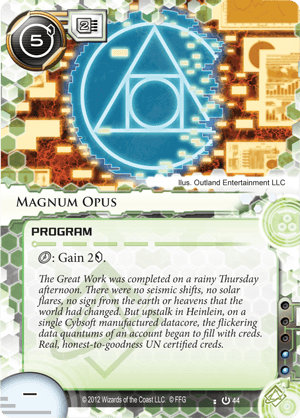 If Magnum Opus was a resource, that wouldn’t stop you being able to click it four times a turn, and it doesn’t matter if you’ve got tagging ICE or a way to interact with resources (that relies on them running, as it often does). As previously mentioned, Tri-Maf Contact is an example of a card I’d be careful with, and you don’t want anyone to get three copies of it (or this and similar cards) to build-their-own Magnum Opus. This advice is angled towards economy cards, but it applies to any self sustaining “engine”. I’m not sure what sort of cards will be printed in the future, but any sort of “engine” that’s self sufficient, unlimited, and does not require you to draw from your deck (or actively discourages it, like Magnum Opus) should be treated with caution. A card which can be clicked like Magnum Opus to put (unlimited) Stealth credits on itself is less egregious than Magnum Opus but it’s still something I would not want to put in my cube. Stealth, in its current form, is interesting and healthy cube design as Stealth credits are limited and the only way to get more is to draw more from your deck. In Netrunner we’re used to evaluating cards from a ‘constructed’ point of view. We see a card and think “hey, this goes well in this deck” or “this is just worse than this other card due to the metagame”. When we’re playing a cube draft, we have to (mostly) throw our constructed evaluations of cards out of the window, as cube drafting is a different world. My top picks of cards that are a lot better in cube than in constructed would be Code Siphon for Runner and Mushin no Shin for Corp. Code Siphon can be great in cube as we’re used to the luxuries of Self-Modifying Code in constructed, as well as ICE suites being a lot better. Mushin no Shin can be used as an economy card and to push out agendas, a use we basically never see in constructed. If you’re new to cube design, I’d highly recommend playing a reasonable amount of cube before you dive in. Very very few cards in Netrunner are “Just Bad” in every environment, and you might find that cards that are unplayable in constructed are some of the best cards you can draft. I want to point something out that I feel that a lot of players get wrong when playing cube., I’m not blaming those players here, but it’s something that makes cube balance an additional challenge. Players new to cube have a variety of misconceptions that come from their instincts established by constructed. A great example of this is the ‘standard’ suite of breakers in cube, Aurora, Force of Nature and Pipeline. In constructed Netrunner, these cards are unplayable and you should essentially never put them in your deck. In cube, there are some drafts and some decks where it is correct to include a copy of some (or all) of them. The two environments are very different, and it’s important to recognise both this, and recognise that some players won’t immediately intuit as such. 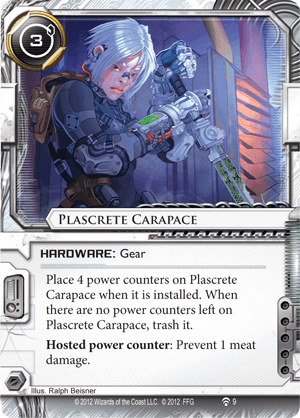 ‘Hate’ cards refer to cards like Plascrete Carapace, cards that you put in your deck to counter another strategy. There are a few types of ‘hate’ cards, and cards like Wraparound which incidentally hates on AI strategies, or Lotus Field which incidentally hates on Datasucker strategies, are cards that I would group with cards like Plascrete Carapace when it comes to cube design. I very much dislike including ‘hate’ cards in cube. The ‘pure hate’ cards like Plascrete Carapace, which do nothing other than hate on other strategies, aren’t good cube includes. Nobody is excited to draft Plascrete Carapace, and it’s more fun to encourage pro-active strategies instead. It’s exciting to play games where you’re both assembling powerful concoctions of cards, and less fun when one player draws a card that invalidates somebody else’s deck, especially when cube doesn’t (easily) allow you to come up with answers to hate cards. What about cards like Wraparound and Lotus Field? These cards are fine on their own, and in cube, you’d play them in a lot of cases where you don’t care about their other ‘bonus’ effect. The problem with these cards is that it discourages otherwise interesting strategies. If you want to make an Overmind + Sage deck as Runner, you’re actively discouraged from doing so if there are three Wraparounds in the cube, and not even on purpose. These incidental hate cards discourage interesting and weird strategies for no good reason. It creates negative experiences when you choose ‘hateful’ cards, including restricting overall cube design, discouraging people from drafting exciting decks, and making for very un-fun game experiences. In constructed Netrunner, these cards are fine and you can actively design your decks to get around them (such as putting an Inti in Atman based decks to deal with Wraparound), but it’s not so easy in cube. I’m not in the market of removing any strategy that’s favourable against another available strategy , and I want people to be able to say things like “wow, your rush deck is really good against my late game runner deck!”, but I think it’s not good when single cards ‘accidentally’ shut down somebody’s deck in cube. I don’t want to discourage interesting decks, I want to encourage them. Be careful with cards that can shut down strategies, I try to be extremely careful with these sorts of cards, to the point of removing essentially all of them. There are a lot of cards to choose from when designing a cube, and there are always replacements for cards that ‘hate’ on strategies or restrict the design of your cubes. The best way to identify problems in a cube is to play the thing! Note things during the drafting process and as you play. If you’re going in with a mindset to test certain things, it can be beneficial to sometimes angle towards strategies that you want to test, but it’s misguided to ‘force’ strategies when they’re not ‘open’. Drafting a strategy when it’s obviously incorrect to do so will do more harm than good. One of the biggest indications of a problem (and indeed, the most problematic thing to have in a cube) is a “First-Order Optimal Strategy”. This refers to a strategy which cannot be (consistently) beaten by an adequate draft on the other side and is never worse than any other strategy, regardless of your ‘seat’ (so, regardless of everything you’ll ‘open’ and everything you’ll be passed). The whole reason I started designing my own cube was because of the presence of a strategy like this in the iteration of the Stimhack cube we played when we first started trying cube drafting locally, namely Crypsis + Magnum Opus. If your cube is well designed, there should never be a First-Order Optimal Strategy, and you should test a great deal to ensure that this is the case. There will always be strategies that are better than others in more situations, but that’s not necessarily unhealthy. The way I gather information about a draft after it is played is using a method suggested to me by my good friend Jonathan Pike, who maintains a Magic: The Gathering cube. He suggested using feedback forms after the draft. When playing your own cube, you cannot draft every seat in the draft, but you have access to a slew of information by asking the people that did! Ask for their thoughts to be written down and talk to them. If you’re playing a 1v1 format such as a Grid Draft or Winchester Draft, you can replace this step with a simple discussion with your opponent. I’ve solicited feedback myself, and I can say that they’re an immense help and I’d recommend anyone who wants to design or tweak a cube to use them. They might seem pretentious, but the benefit is worth it. After the draft, when you’re looking to update the cube next, make sure to note the information recorded in your feedback forms. The most salient information includes Corp vs Runner winrate and thoughts people had on their archetypes/decks. It should be clear that anomalies happen, and don’t go crazy on rebalancing your cube because of one lopsided draft, but you should rebalance things if the same results repeat themselves or the same sort of feedback is received. You need to do a lot of testing to get accurate feedback and create an adequately balanced environment. Lucky for us, this is a good excuse to play more cube drafts! I had an interesting discussion with Ben Ni (beyoken) a few weeks ago about Medium and how good it was in Cube. He thought it might be too good, as he’d heard multiple players say so. This spawned an interesting discussion that I feel the need to repeat here. I don’t necessarily agree with the statement that Medium is too good, but, for the sake of argument, let’s suppose for this section that Medium was a card that was too strong in cube and all of our feedback and play experience indicated this. How do we fix it? The obvious solution to fixing a card like Medium in cube would be to take it out or replace it with a weaker (or different) card. I think that this would be a misguided solution, and I think the cube would suffer for it. 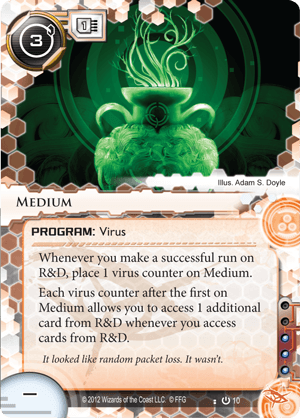 Medium is a card that’s good for cube, as it rewards Runners for being pro-active and it lets the Runner give up scoring windows for some shots at R&D. It’s a healthy card in and of itself, and creates interesting gameplay that should be cherished and nurtured. This should all be intuitive, and it feels ‘obvious’ in many ways. This is a good thing! The hard part is picking which of these you should change. This can and will be guided by your experiences, and what you feel needs improving, or alternatively what can be improved most elegantly and with least design issues. Maybe the only way to bolster Corp economy is to include cards that aren’t great cube design, but adding in stronger ICE will let you include cards that are good design but that you might have originally feared might have been too strong. I want to briefly mention that you should be very conservative with changes, even though it seems like a cube is made up of a lot of cards, you’d be surprised at how impactful even a few changes can be. A few cards can increase the power of a side a great deal, and high levels of power variation can be dangerous. To conclude this section, I want to summarise what it’s trying to say because this is something I consider very important. Sometimes, the best way to balance cards that are currently too strong or too weak for cube is by changing things that aren’t that card. Cards being too strong might indicate other problems in your environment. The hypothetical of Medium being too strong might be more of an indication that repeated runs are too easy, for example. Make sure to narrow down what the problem is, as a card that’s too good in the current environment might not indicate that the card that’s too good is the problem. Medium is a healthy card if the rest of the environment is healthy.